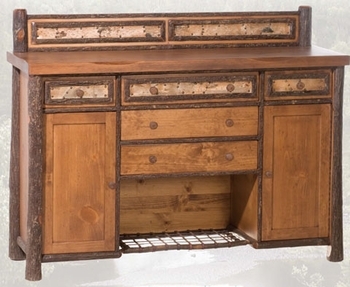 Like a piece from the old West, this rustic sideboard offers loads of space for storage in a beautiful cabinet. With the birch-bark accents, straight-line detailing, and little lower shelf of woven rawhide, it will be a truly 'show-off' piece in your dining room. Various wood and finish options available. Picture shown with regular bark, rustic finish and pioneer pine wood (additional cost). Price listed may not reflect price of the item as pictured. Made in the USA! 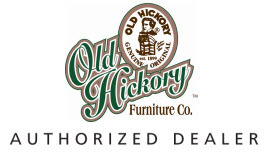 Available in Hickory with either Veneers (oak, pine or cherry), Solids (Pioneer oak, Pioneer pine, or Pioneer cherry), or Barnwood (Aged barnwood or Pioneer barnwood). 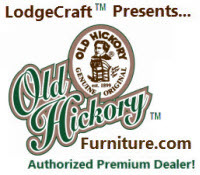 Available in a variety of Hickory wood bark texture finishes too, see our Hickory Bark and Finish Options. Shown in regular bark with rustic finish and pioneer pine wood with birch bark accents.